The 13th Brighton Boys’ Brigade was always a very strong company at Lewes Road United Reformed (previously Congregational) Church. This photo shows the Junior Section in 1969/70. The photo was taken in the same location as that of the 1950s picture of the Maids’ Brigade, and some of these young lads, me included, would have been either contemporaries of, or related to, some of the girls shown in the 1970s photo of the Maids Brigade. The Captain was Bert Hussey in my time, and the other officers in the photo include Ian Sayers, and the church minister Revd Ronald Waters who had a glass eye. Amongst the boys are Chris Weller, Terry Grayer, Kevin Bushby & Graham Fowler. I remember the Junior Section with a deal of nostalgia, and can remember things like the weekly inspections at which we had to show the back and palms of both hands. We also had to lift our knees for inspection (we had to wear short trousers) to show that we had washed properly. If memory serves correctly we met every Thursday evening during the period September to May in the church hall. During the summer, most weeks we would meet either up at the Race Hill on the grass at Warren Road/Tenantry Down Road/Bear Road for games, or go to Black Rock to see what we could catch in the rock pools. When I was a kid in the 1930s my uncle Harry was captain of the 13th and we always went to displays usually held in the Intermediate School Hall, York Place. Their Church was then the Lewes Rd Congregational and the boys always wore the pillbox hats with two white bands which encircled the pill box, and a whitened band crossing the chest which I believe had a white bag on the end. His name was Harry Norman. He had been gassed while in the army during the first World War and had been shell-shocked I think. I used to be taken to see the B.B. displays at their camp in a field at Glynde, nr Lewes. Harry had 2 children, Les and Betty and his wife was Auntie Bessie. I used to have a record made at the 50th anniversary of the Boy’s Brigade, I have lost the record but I remember some of the words of the two songs on it. Stevie; I wonder if your Harry Norman was related to a near contemporary of mine in the company section – David Norman? I believe he did have prior family connections with the 13th. The uniform you describe was still worn until around 1971/2 when the hats were changed for forage caps. I have photos of me in the the company section just as you describe, on display days, at York Place. Maybe, I’ll put one of them on here as well. I believe Les and his wife had two adopted children one of who was named David. Les’s wife was Edna and she is still alive but I don’t have the address. His sister Betty died some years ago. She never married and had no children. Edna Norman and her two children lived next door to my Grandad in Park Road, Coldean….David and Sheila are the children. As far as I’m aware she is still alive, but not sure if still there. Hi. I was in the 13th from 1968 to the early 70s. My father was Stan, 13th’s Band Officer. Now I’m Captain of the 26th Brighton and one of my officers is David Norman, son of Les and Edna, grandson of Harry. I remember Geoff and his older brother, Bob. I also “bumped into” Nick Wellfare last week. Hi Paul, I remember you and your dad too. Good to see I’m not the only one still around. I also remember Nick and the Welfares lived next door to us in Hartington Rd. I’ve got some of the old company photos from the display nights – I’m sure you remember them -at Fawcett Place. I’ll try and get a couple posted up on here and we’ll see who else is around. I alwys enjoyed hearing the band – I recall your dad kept them up to a pretty good standard, even today (and partly, I guess, due to a career in the forces). I love the sound of drums and bugles and can still picture your dad teaching the band. I am the David Norman Paul Simmons wrote about, Since 1992 I have been a BB officer, in date order at the 29th (Hounsom Memorial URC) where my son Daniel joined the Junior Section, he later served in the company sections of the 25th and 13th he was discharged in 2000. I was also an officer in the 13th from 1995 and from 2000 at the 22nd Hove Methodist church where I am still a member. My Grandfather Harry joined the 13th in 1910 and I am still a BB Officer in 2012/13. Also Paul and myself still play regularly in the Bugles and drums of the steadfast association. There have been many changes since I was a boy in the 13th But I am proud to Know that four generations went through the 13th before its demise. In the final days of the 13th It was Captained by an officer of the 13th Girls’ Brigade Company Mrs Darryl Sinclair (Daughter of the Rev Brian Stone) apart from her I was the last Officer and my son the last NCO. Hi David; I remember you. It’s good to know that I am not the only one with fond memories of the 13th, I was quite saddened when I eventually learnt that it was no more. Since I haven’t lived in Brighton really since I was 16, I only rarely keep up with developments there (other than through this site). I now live on the East coast and one of my sons is both a Merchant Navy Officer and a member of our local RNLI lifeboat crew. At the annual lifeboat blessing service, there is one hymn that I sing with rather more gusto than my voice (and the somewhat elderly Salvation Army band) warrants. It does, of course, start “Will Your Anchor Hold”. It still has meaning for me. I remember back in those far off days after Bible Class walking up Hartington Road with you and Brian Steinicke, I also remember you had two elder brothers one was Bob, was the other Dave? To explain my email address dkn is obviously me, hmc is my church, Hove Methodist, where I was an officer in their company the 22nd Brighton which closed in 2003, and bb is The Boys’ Brigade. Apart from my son who I mentioned in an earlier text, I have a daughter Sarah who lives in Milton Keynes. It frightens me to think that I have a 27 year old daughter and a 30 year old son. My son served in 3 BB companies the 29th Hove (now closed) 13th Brighton consecutively with the 25th Portslade. Although we were connected with the 13th the 29th and 25th were from the area we live in. I have funny stories regarding my name, for instance when I first went to the 22nd in 2000, just after the closure of the 13th, I went to my first church parade there and whilst waiting at the bus stop a former captain of that company stopped and gave me a lift, he asked my what company I came from and I replied the 13th. His response was “Ah yes, the Normans”, I turned round and said I am one. In 1992 I started as an officer in the 29th Hove and when that closed in 1995 I became an officer an the 13th in 1996. I went with the 13th to Glynde camp and one night in the mess tent the camp commander, Brian ‘Pixie’ Pickard, was cutting a cake, I said can I have a slice (he didn’t know me). He said you can’t have a slice till you’ve been coming a few years, so I said to him my family had been coming here for years, to which he said are you related to the great man. A voice from the deep recesses of the tent replied yes he is; so Brian Pickard said to me to take the whole cake. I can’t get away from may name. Incidently, when the 13th Lifeboy team first started in the late 1940s, its first leader was my dad’s sister Betty Norman who was a school teacher. In the BB cupboard at the 26th they have the original colour for that company which was given to them by the 13th. The 26th is now in its 52nd session so the Captain of 13th at that time would have been Ted Benham. It was sad to see the old company go but that is the same with most of the Brighton Hove & District Battalion, there used to be in the 60s & 70s 30 companies in the Battalion – there are now 12, and 3 of those are new. David Norman says that the life-boys started in the 1940s. My late brother was in the 13th in the 1930 whereas I being his little brother was in the life boys in the Connaught Institute across the road. 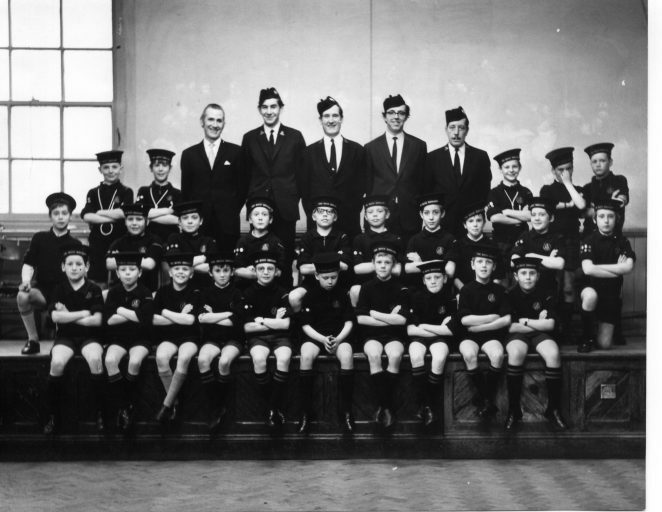 Are life-boys junior Boys Brigade? I recognise Bert Hussey, sadly no longer with us and Ian Sayers, both officers in this picture. Hi David & Kerry; I remember you and Brian Steinicke well and also a number of others (including the Fogden brothers – there has been a posting elsewhere on this site by a Fogden – possibly one of them). I also recall that the older boys used to go out to a coffee bar somewhere in Hove after Bible Class on a Sunday – I remember that was the first place I heard (or at least noticed) Queen’s ‘Bohemian Rhapsody’. Sad to here of Bert’s passing, although since we are in our 50s now I guess that was inevitable. It has to be said that the formative years we spent at Lewes Road, were not, in my view anyway, wasted; I learnt much and look back on them and all those I knew in BB, MB and Dot’s drama group with nostalgia. I think the leaders and officers concerned did a good job and it is sad that so many of today’s youngsters (hark at me) seem to have no similar figures in their lives. David; you say your daughter lives in MK; ironically, despite living on the east coast, I work near MK during the week and in Jan will actually move offices to the edge of MK. My own sons are both in their 20s now, one at sea and one in the ambulance service. Both either have been or are leaders in youth organisations – one the Scouts and the other St John Ambulance cadets and have won awards for saving lives. I joined the 30th around 1948. The parades were held in the “new” Carden School in Hollingbury, Patcham. The captain was “Bumble” Griffin and there wer lieutenants Les Harris and Mr Constable. I believe there was a second BB company based in The Barn Methodist church in Patcham. My father Ebenezer Charles Snelling (Charlie) was in the 13th in Dorset Gardens just before WW1. I recall the Glynde Camp in about 1950 and the filthy old swimming pool in the Village. John Snelling. I’ve just remembered a couple of things about the church halls at Lewes Road – In the smaller back hall with the stage, there was a wooden memorial to Ernest Beale VC – I wonder if that was removed and preserved at all when the church was closed – I hope so. In the larger side hall there was a large relief of the Last Supper. I doubt that could have been preserved but I do remember it as having vivid colours and looking down on us playing 5 (or more) a-side football or British Bulldog! Hi everyone. I was in the 13th in the mid from the late 1950’s, life boys up to mid 1960’s in the BB. Eventually playing some footy with the BBOBs later. Had some good times hanging out with friends back then. I met Bert Hussey some years ago, always a gentleman. I remember Bob Robbins, Pete Ilott, Micky Benham, Ian Sayers, Pete Gee. My mother played the church organ and piano for the Operatic Society, the life boys bells. Hi Allan – How could I have forgotten the Tubular Bells? I wasn’t very keen at the time but at least I knew what they were when Mike Oldfield produced Tubular Bells! Ironically, through my connections with a choir I was at a handbell ringers concert a few months ago and they had some tubular bells there as part of their ensemble. Sad to say my brother Bob, whom you mention, is not very well at all these days; such is life. I am, however glad to hear that he is still remembered from the good times. Hi Allan, What was the name of your mother? I was connected to the operatic society for many years. I am sure I’ll remember her. Recognised a few names there. I was the same era as Brian Steinicke, Pete Dickens, Graham Askew, Mick Adams and others. The last officer in the picture is my dad Derek Fogden and I think my youngest brother Keith is in the front row (the one not looking that interested with fair hair).I was in the lifeboys before going up to the company section with the older lads Nick Welfare, Andy lovelidge, the Woolley brothers, Mickey Baker and many others. Hi Robert, I remember you and recognise most of the names you mention, although I really didn’t remember the officer in the row as being your dad. IIRC, you also had a brother the same age as me – Tony? Hi Geoff. I remember your name but not you – sorry. Yes, Tony is my brother and I was surprised that he wasn’t in the photo as he was the same school year as Terry Grayer who is. Although I left when I was 15, I thoroughly enjoyed my time at the 13th – great for sport and keeping youngsters off the streets most nights of the week – how things have changed! Hi Geoff, I am sorry to read that Bob is not so well these days. He was a good friend back then, and a damn good footballer. I went to the same senior school as your older brother John. I suspect he knew Paul Fallows? Hi Sandra. My mother was Edna Fowler, and my sister Anne was in the Operatic Society. I used to sit there turning the music pages for my mother when she played. I see another name I remember mentioned by Robert – Andy Lovelidge. He was a good mate of mine too. Hi Alan – I will ask John about Paul Fallows. Bob always did enjoy his football, I can’t honestly say I watched him very often but can remember him coming home on winter Saturday evenings full of the match. I can remember Andy Lovelidge’s name too – he and Bob were friends IIRC. I am arranging a Founder’s Day dinner on Oct 4th to celebrate the 130th anniversary of The foundation of the Boys’ Brigade for former members and their guests. There are still places available. Persons interested should contact me on 01273 888032. I have also been present at BB Glynde Summer Camp. I seem to remember one day of the camp was open day for visitors so Mum, Dad and I would trundle off in dad’s motorbike and sidecar and spend an afternoon at camp. Long years back! Hello Allan Fowler. I certainly remember Edna Fowler and Ron too. I suspect Edna played for the G&S operatic section after Winnie Churcher sadly passed away. As for Anne Fowler I am certain that was the Anne who was in the Pantomime section. I also joined panto for a couple of years or so around 1959. Anne maybe stepped into G&S after I stopped taking part in things around 1961. As for you, Allan, I can’t place your face but I must have seen and known you. I know you have seen the ‘Pantomime’ page I sent in as you have commented there. Have you looked at the ‘Gilbert and Sullivan’ photos? Great pictures of Ron there. I was very luckily sent those photos by John Killick. Have you seen the Maids Brigade photo sent in by Grannie? Very nice picture of Sheila there. So now we have linked the Boys Brigade, Maids Brigade, Pantomime and G&S activities to the one venue all we need is for someone to come up with some photos of the Drama Group plays. Any offers anyone? Hi Sandra. My mother was not Ron’s Edna, although they were related I understand, cousins? I remember turning the music pages for the G&S operetta’s as well as when she played the church organ. Anne was in the G&S as well as pantomine group. She is just over 4 years older than me so maybe you wont recall my face. I was in the same age group as Bob Robbins and Pam George to name a couple. Hi All. I was in the Maids Brigade in the ’50s to ’60s and my sister was Valerie Reeves. We lived at Shanklin Road. My particular friends were Christine Sargeant, Frances King and Susan Steadman and Marie Elphick. I remember Geoff Fitch, Alan Hollis, Allan Fowler and Nicholas Welfare. We went to church Sundays and then we would often go to the Penny Farthing Coffee Bar after. Sometimes us girls would go to watch the boys play football at Whitehawk and we would meet up in the school holidays. Happy Days. Hi all. I have just remembered another name from the past in my group of friends and that was Pamela George. There was another sister Mary and I do believe there was a third sibling whose name I cannot remember as they were more my sister’s age group. Hi Sally, I remember you and all the others you name. They were great times growing up and thinking we had answers to all the world’s problems. I hope you are well and life is being kind to you. Yes ! Another Norman. Just found this page and so interested to see all the names. Harry Norman was my Uncle. Very happy memories of my time at Lewes Road. Also spent many happy times at Glynde Camp. I am still an Officer in BB at 1st Polegate Company. Would love to hear from anyone who remembers me. If you go the 13th b.b. other page re. football teams, you might see people you knew. Hello Audrey. I hope you are still reading this page. I remember you as the wife of a very good friend of mine, Roy Virgo. He and I were in the 10th Brighton(Hove) B.B. Company together. Roy first introduced me to the B.B. in 1950. I will always remember him gratefully for that. I last saw you at the Stedfast reunion in January – I think – 2015. We had a brief chat then. I didn’t manage to get to the reunion in January this year as there was quite a bit of snow on the roads where I live now (Buckinghamshire). I hope you are still keeping as well as Father Time will allow. Your uncle Harry Norman was C.O. of one or two of the Glynde camps I attended in 1951 (and 1952?). Earlier contributors have mentioned the significant service given to the B.B. by members of the Norman family and it is great to learn that, at least up to July 2014, this was still continuing through you, and maybe others? Great to see some of the names here. Another one to mention is Dave Kydd who is the one next to the vicar in the photo. John Horne was another who went down to the Penny Farthing or the Malacca coffee bars on a Sunday. The Edna Fowler mentioned used to live in Stanmer Villas. Nick and Andy were good footballers as was John. Ted Benham was a legend. When we wanted to set up a youth club he had the faith in us to run it for ourselves for which I hope and believe we never let him down. This massively influenced my career as a youth worker. Mick, his son, was a good lad – big fan of the Shadows. Probably a good place to end my reminiscence! Hi John – I remember you too. Thanks for reminding me of Dave Kydd’s name – it has been bugging me on and off for months. I remembered the face but couldn’t put a name to it. Blimey, I was only made aware of this photo by my brother, John, who now lives in Australia. A blast from the past. I am the pretty one at the back, just to the left of the men. I saw Bim Simmons the other day in a café in Brighton, still looks the same. I think Tony Fogden is at the back far right? Hope all in the photo are fit and well. Hi Terry; I remember you well. It’s good to know that there are others from this picture still around. I trust that you are keeping well. I was a member of BB at the Church on Lewes Road in the mid-late 80s and I remember a really big guy and a lady called Liz, a Spurs fan I think. We had a great footie team and I remember them doing a sleep over in the hall once and a big fry up in the morning. I got onto this thread by googling the 29th. However, I remember Paul Simmons, he was a contemporary of two of our older members, Bob Jackson and Dave Rhodes. I believe he succeeded Dave as the Battalion Band solo bugler. He was a lad that most boys from other companies knew of and recall he was awarded the Beal VC watch. I also recall Stan coming up to Hounsom & assessing us for our bugler’s badge. My brother, Phil and I were both members of the 29th from Nippers to Life Boys to Company section. Our Captains, during this time, were Bill Jackson, Pat “Paddy” Lay and Bert Maynard. When Pat moved to Lindfield and formed the 1st, Phil assisted him as a Staff Sergeant. He also became a Lieutenant in the 29th when captained by Graham Mitchell in the 80s. In 1969, we did the “double” at the Battalion Band & Drill competition held in the Corn Exchange. We also won the Table Tennis League in 1970-71. I particularly remember hard fought games against Stuart Neate of the 16th and Dean Funnell of the 30th; I believe both became officers in their respective companies. Good afternoon one and all, just reading through these memories and another name appeared that I remember now. David Kydd, dark-haired, very good-looking young man. I wonder where all of you I mentioned are now. Last year I did see Hilary nee Webber, Hilary was more my sister Valerie Reeves’s friend but she recognised me straight away,that was very nice. Unfortunately our busses came so our chat was very brief. Hope wherever you all are that you are all well.